Ever since HoloLens and Windows Mixed Reality first came along, I’ve been curious about the realities of the spatial mapping APIs and yet I’ve largely just treated them as a “black box”. That said, I’ve still had it on my “to do list” for a long time to visit these APIs a little more directly and that’s what this blog post is about. It’s important to say that the post is mostly meant to be just “for fun” to give me a place to write down some explorations – I’m not planning to do an exhaustive write up of the APIs and what I’ll end up with by the end of this post is going to be pretty “rough”. It’s also important to say that there are official documentation pages which detail a lot more than I’m about to write up in this post. but (as usual) I hadn’t really read those documents in nearly enough detail until I started to explore on my own for this post – it’s the exploration that drives the learning. but, again, I hadn’t actually seen this sample until I got well into writing this post and was trying to figure things out and I realised that I was largely trying to produce a much simpler, less functional piece of code which targeted a different type of application than the one in the sample but there are many similarities between where I ended up and that sample. So, if you want the definitive views on these topics there are lots of links to visit. In the meantime, I’m going to write up my own experiments here. Generally speaking, if I’m wanting to experiment with some .NET APIs then I write a console application. It seems the quickest, easiest thing to spin up. In a Mixed Reality world, the equivalent seems to be a 2D XAML application. 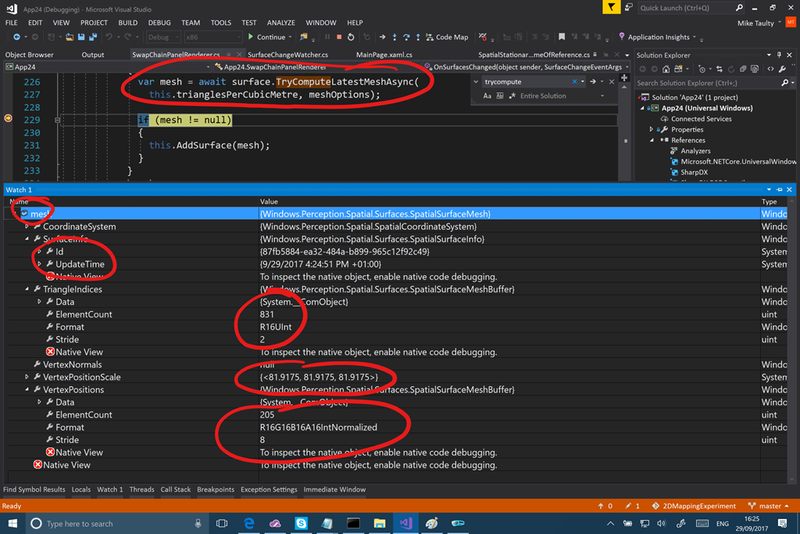 I find it is much quicker to Code->Deploy->Test->Debug when working on a 2D XAML application than when working on (e.g.) a 3D Unity application. Of course, the output is then a 2D app rather than an immersive app but if you just want to test out some UWP APIs (which the spatial mapping APIs are) then that’s ok. 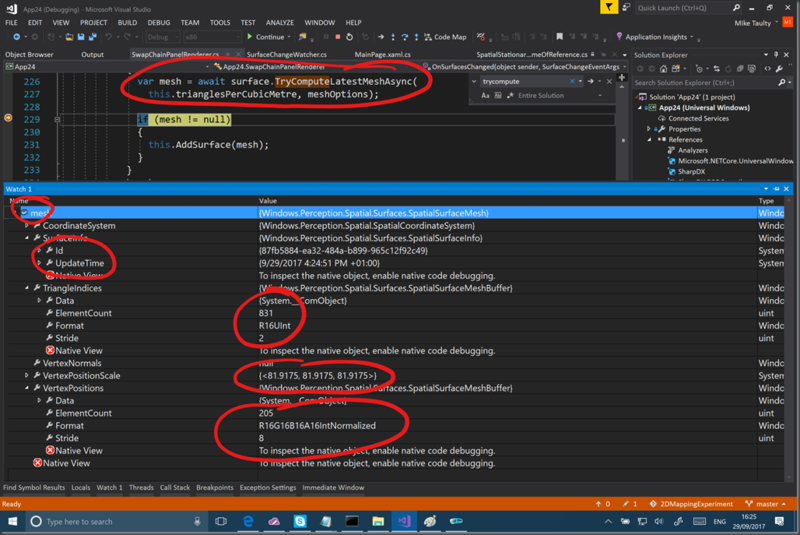 Specifically, in this case, I found that trying to make use of these APIs in a 2D environment seemed to actually be helpful to gaining some understanding of them as it stopped me from just looking for a quick Unity solution to various challenges and I definitely felt that I wasn’t losing anything by at least starting my journey inside of a 2D XAML application where I could quickly iterate. I made a quick, blank 2D XAML UWP application in Visual Studio and made sure that its application manifest gave me the capability to use Spatial Mapping. in case you ever got stuck on that one. From there, I had a blank app where I could write some code to run on the Loaded event of my main XAML page. At this point, I had an idea of what I wanted to do and I was fairly sure that I needed to spin up a SpatialSurfaceObserver which does a lot of the work of trying to watch surfaces as they are discovered and refined by HoloLens. The essence of the class would seem to be to check whether spatial mapping is supported and available via the IsSupported and RequestAccessAsync() methods. Once support is ascertained, you define some “volumes” for the observer to observe for spatial mapping data via the SetBoundingVolume/s method and then you can interrogate that data via the GetObservedSurfaces method. Additionally, there’s an event ObservedSurfacesChanged to tell you when the data relating to surfaces has changed because the device has added/removed or updated data. Now, as far as I could tell the SpatialSurfaceObserver.IsSupported() method only became available in V4 of the UniversalApiContract so I’m trying to figure out whether it’s safe to call that API or not as you can see above before using it. I wanted to keep things as simple as possible and so I chose to look at the SetBoundingVolume method which takes a single SpatialBoundingVolume and there are a number of ways of creating these based on Boxes, Frustrums and Spheres. I figured that a sphere was a fairly understandable thing and so I went with a sphere and decided I’d use a 5m radius on my sphere hoping to determine all surface information within that radius. However, to create a volume you first need a SpatialCoordinateSystem and the easiest way I found of getting hold of one of those was to get hold of a frame of reference. Frames of reference can either be “attached” in the sense of being head-locked and following the device or they can be “stationary” where they don’t follow the device. A stationary frame of reference seemed easier to think about and so I went that way but to get hold of a frame of reference at all I seemed to need to use a SpatialLocator which has a handy GetDefault() method on it and then I can use the CreateStationaryFrameOfReferenceAtCurrentLocation() method to create my frame. So…my reasoning here is that I’m creating a frame of reference at the place where the app starts up and that it will never move during the app’s lifetime. Not perhaps the most “flexible” thing in the world, but it seemed simpler than any other options so I went with it. // We want the default locator. // moving with the user). // and is hopefully oriented to the Z axis and a certain width/height. Ok…I have got hold of a SpatialSurfaceObserver that’s observing one volume for me defined by a sphere. What next? 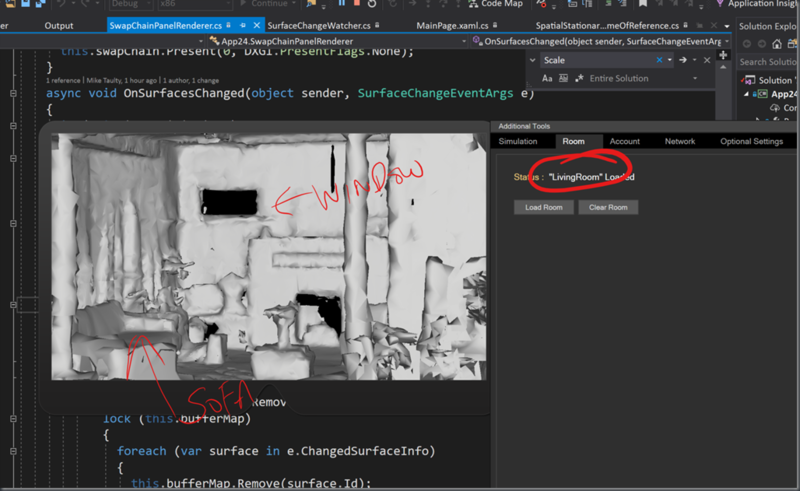 Having now got my SpatialSurfaceObserver with a defined volume, I wanted some class that took on the responsibility of grabbing any surfaces from it, putting them on a list and then managing that list as the observer fired events to flag that surfaces had been added/removed/updated. 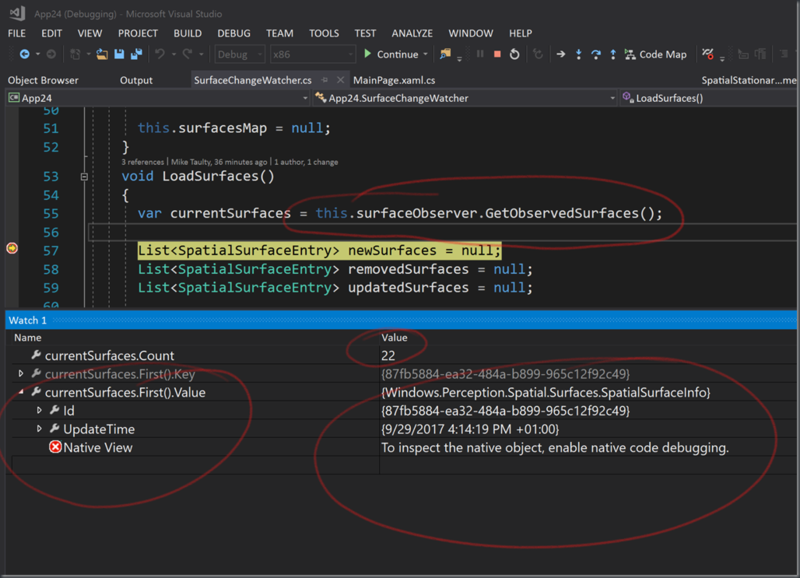 In a real application, it’s likely that you’d need to do this in a highly performant way but I’m more interested in experimentation here than performance and so I wrote a small SurfaceChangeWatcher class which I can pass the SpatialSurfaceObserver to. 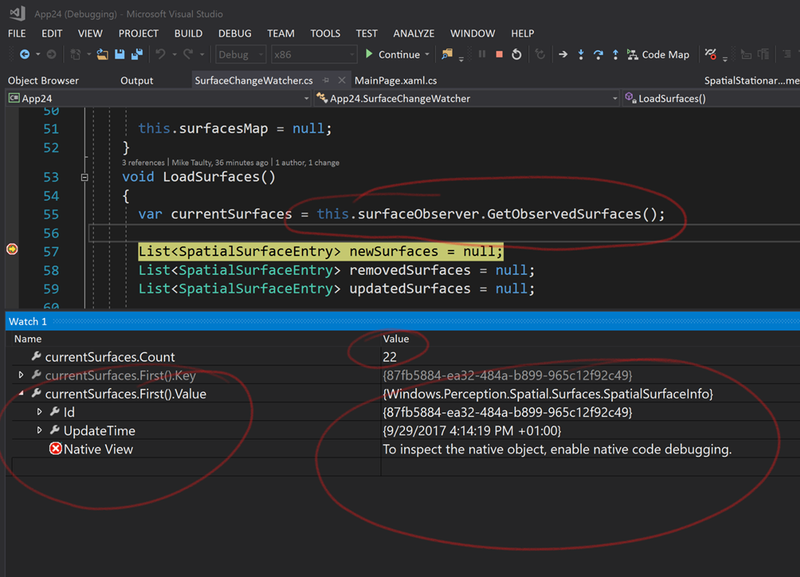 Surfaces are identified by GUID and so this watcher class maintains a simple Dictionary<Guid,SpatialSurfaceInfo>. On startup, it calls the GetObservedSurfaces method to initially populate its dictionary and then it handles the ObservedSurfacesChanged event to update its dictionary as data changes over time. It aggregates up the changes that it sees and fires its own event to tell any interested parties about the changes. I won’t post the whole source code for the class here but will just link to it instead. It’s not too long and it’s not too complicated. At this point, I’ve enough code to fire up the debugger and debug my 2D app on a HoloLens or an emulator and see if I can get some spatial mapping data into my code. It’s worth remembering that the HoloLens emulator is good for debugging spatial mapping as by default the emulator places itself into a “default room” and it can switch to a number of other rooms provided with the SDK and also to custom rooms that have been recorded from a HoloLens. and you can see the ID for my first surface and the UpdateTime that it’s associated with. I also notice that very early on in the application I see the ObservedSurfacesChanged event fire and my code in SurfaceChangeWatcher simply calls back into the LoadSurfaces method shown in the screenshot above which then attempts to figure out which surfaces have been added/removed or updated since they were last queried. So, getting hold of the surfaces within a volume and responding to their changes as they evolve doesn’t seem too onerous. But, how to get the actual polygonal mesh data itself? Once you have hold of a SpatialSurfaceInfo, you can attempt to get hold of the SpatialSurfaceMesh which it represents via the TryComputeLatestMeshAsync method. This method wants a “triangle density” in terms of how many triangles it should attempt to bring back per cubic metre. If you’ve used the Unity prefab then you’ll have seen this parameter before and in my code here I chose a value of 100 and stuck with it. That screenshot shows that I’ve got a SpatialSurfaceMesh and it contains 205 vertices in the R16G16B16A16IntNormalized format and that there are 831 triangle vertices in an R16Uint format and it also gives me the Id and the UpdateTime of the SpatialSurfaceInfo. It’s also worth noting the VertexPositionScale which needs to be applied to the vertices to reconstruct them. Now, at this point I felt that I had learned a few things about how to get hold of spatial mapping meshes but I thought that it wasn’t really “enough” if I didn’t make at least some attempt to render the meshes produced. I thought about a few options around how I might do that given that I’m running code inside of a 2D XAML application. I wondered whether I might somehow flatten the mesh and draw it with a XAML Canvas but that seemed unlikely and I suspected that the best road to go down would be to keep the data in the format that it was already being provided in and try and hand it over to DirectX for rendering. 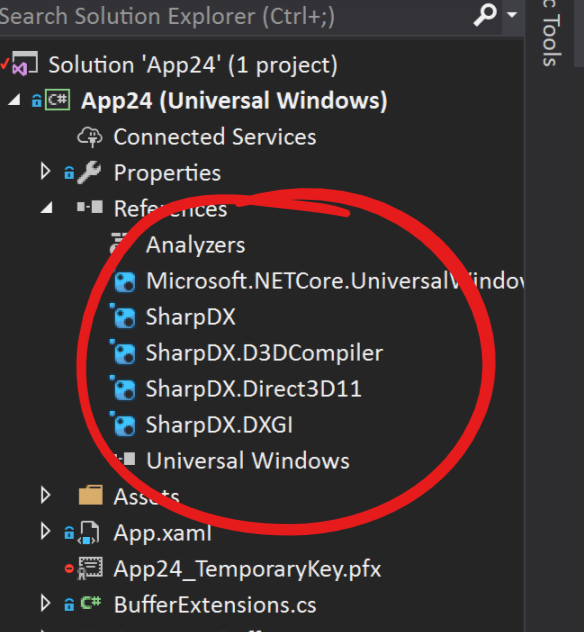 That led me to wonder whether something from Win2D might be able to draw it for me but Win2D stays true to its name and doesn’t (as far as I know) get into the business of wrapping up Direct3D APIs. So…I figured that I’d need to bite the bullet and see if I could bring this into my 2D app via the XAML SwapChainPanel integration element with some rendering provided by SharpDX. 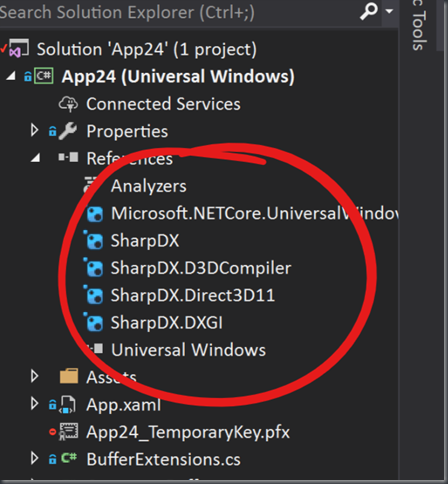 In order to try and achieve that, I went on a bit of a search to try and see if I could find a basic sample which illustrated how to integrate SharpDX code inside of a XAML application rendering to a SwapChainPanel. and the sample was really useful in that it enabled me to drop a SwapChainPanel into my XAML UI app and, using code that I lifted and reworked out of the sample, I could get that same triangle to render inside of my 2D XAML application. That gave me a little hope that I might be able to get the mesh data rendered inside of my application too. I wrote a class SwapChainPanelRenderer (source) which essentially takes the SwapChainPanel and my SurfaceChangeWatcher class and it puts them together in order to retrieve/monitor spatial meshes as they are produced by the SpatialSurfaceObserver. It Initialises D3D via SharpDX largely following the pattern from the sample I found. It creates a very simple vertex shader and pixel shader much like the sample does although I ended up tweaking them a little. Whenever the renderer is asked to render, it loads up the right vertex/index/constant buffers for each of the meshes that it knows about and asks the system to render them passing through a few transformation pieces to the vertex shader. In order to get hold of the actual vertex data, this code relies on using unsafe C# code and IBufferByteAccess in order to be able to grab the real data buffers rather than copying it. The second point that might be worth mentioning is that I spent quite a bit of time trying to see if I could get the mesh rendering right. I’m not 100% there at the time of writing but what I have managed to get working has been done by consulting back with the official C++ sample which has a more complex pipeline but I specifically consulted it around how to make use of the SpatialSurfaceMesh.VertexPositionScale property and I tried to make my code line up with the sample code around that in as much as possible. I must admit that I spent a bit of time staring at my code and trying to compare to the sample code as a way of trying to figure out if I could improve the way mine was seeming to render and I think I can easily spend more time on it to make it work better. The 2D app starts at a position (0,0.5,0) so half a metre above where the HoloLens is in the world. The 2D app doesn’t know the orientation of the user so could be pointing in the wrong direction with respect to the mesh. At the time of writing, I’ve mostly been trying this code out on the emulator but I have also experimented with it on HoloLens. and, seemingly, there’s something of a mirroring going on in there as well which I still need to dig into! As I said at the start of the post, this one was very much just “for fun” but I thought I’d write it down so that I can remember it and maybe some pieces of it might be useful to someone else in the future. If you want the source, it’s all over here on github so feel free to take it, play with it and feel very free to improve it .